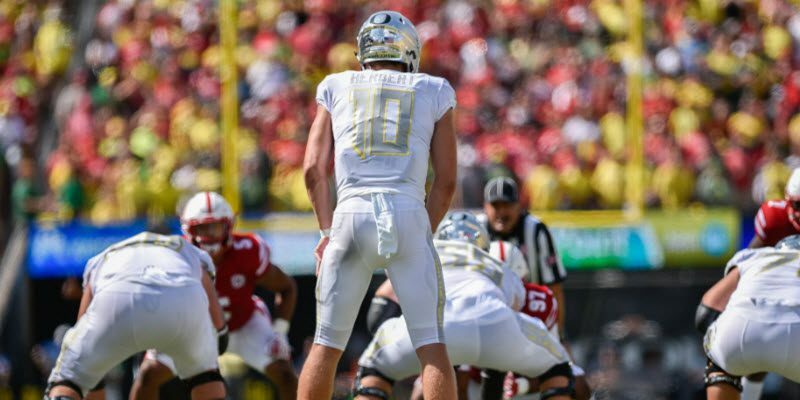 Justin Herbert is the heartbeat of Oregon Football. When he is in the lineup, the Ducks’ offense is one of the most intimidating forces in all of college football. The fresh-faced gunslinger from Sheldon can do it all. He can drop a 40-yard bomb at the flick of a wrist, thread a dart between multiple defenders or use his legs to take it in for “six” himself. His list of strengths is too long for this article, and his weaknesses can be counted on one hand. And yet, somehow, his career seems unfulfilled. Although he’s clearly a rare talent, he has not been able to put everything together during his first two seasons. To this point, Herbert has managed just an 8-7 record, along with a disappointing loss in a bowl game that the Ducks were favored to win. That isn’t all on him; there are plenty of reasons that the Ducks have been a non-contender in the conference during his career. But fair or not, a quarterback’s legacy is primarily defined by his wins and losses. In today’s fickle society, which often ignores things such as context and circumstance, I can’t help but wonder if Herbert’s impact will be forgotten. Will Oregon’s lack of sustained team success tarnish his legacy, or can he use this season to catapult himself into elite status? What Has Herbert Done So Far? Listing Herbert’s accomplishments, both on and off the field, is a lengthy task. He’s a scholar in the classroom, as he completed the nearly impossible feat of starting at quarterback while also earning a spot on the PAC-12 All-Academic First Team. On the field, his athletic abilities have been evident since his early high school days, when he starred as the best quarterback in the state. Not to mention, he also played baseball and basketball — you know, just for fun. 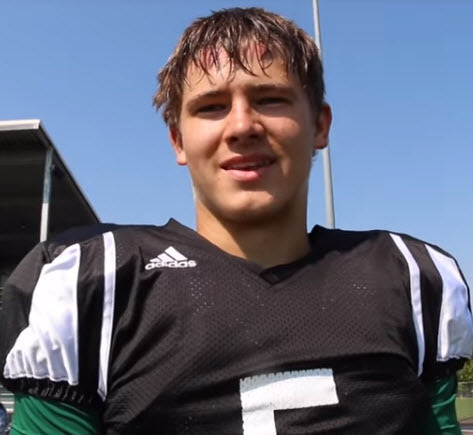 Justin Herbert was a tri-sport athlete in high school. NFL evaluators are drooling in anticipation of what might be Herbert’s final season. From his senior year in high school through his first two years in college, he’s displayed immense potential. At 6’6, 230, Herbert has the frame that coaches covet. He’s an athletic marvel with the raw talent and natural arm strength to thrive in a number of different sports. And, most importantly, he has excelled on the field at every level. 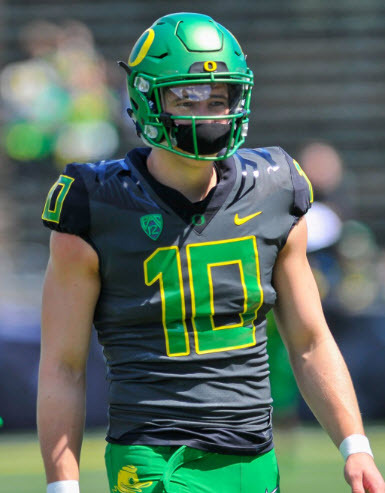 In his career thus far, Herbert has thrown 34 touchdowns to just nine interceptions, a ratio better than that of former USC quarterback and third overall draft pick Sam Darnold. His 167.52 passer rating in 2017 would have ranked fourth in the country, if he had played in enough games to qualify. Former UCLA quarterback and tenth overall draft pick Josh Rosen managed a rating of only 147.0 in his best (final) season. Herbert also tied Bill Musgrave’s single-game passing yardage record when he torched the Arizona State defense for 489 yards — as a true freshman. These numbers are only a few of the many feats that the young quarterback has accomplished thus far. Herbert tied Bill Musgrave’s record with 489 passing yards against Arizona State in 2016. It’s hard to ask for much more from a lightly recruited kid who wasn’t even the top quarterback the Ducks signed in his recruiting class. In what has been a tumultuous time for Oregon football, Herbert has been the centerpiece, saving the Ducks from falling out of the national picture entirely. Still, it seems like his story is incomplete. As great as his career has been thus far, the Ducks have failed to break through, despite his abilities. He suffered through a trying season during the collapse of the Mark Helfrich era in 2016. Then, just as the Ducks began to find their stride in 2017, he missed five games with a broken collarbone. Finally, in his most important game to date, he concluded the season with a dud. Heading into 2018, Herbert lacks the signature wins and the championship pedigree that typically define the all-time Oregon greats. 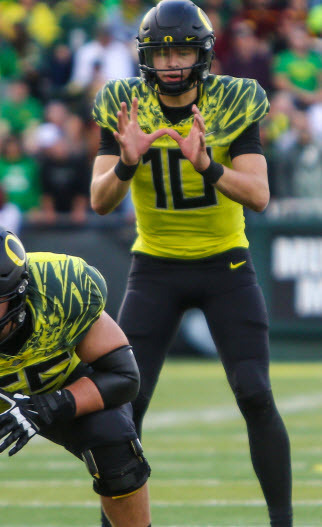 There are mitigating circumstances (his injury, the coaching turnover and the defensive inconsistency), but the Ducks have been gifted with some of the greatest college quarterbacks of this generation in recent years, so the bar is pretty high. Of course, Marcus Mariota is the current gold standard for Oregon quarterbacks, but there are plenty of other great Oregon quarterbacks as well. In the last two decades alone, we’ve seen Joey Harrington, Jeremiah Masoli, Dennis Dixon, Darron Thomas and Vernon Adams Jr. don the yellow and green and bring the program to extraordinary heights. 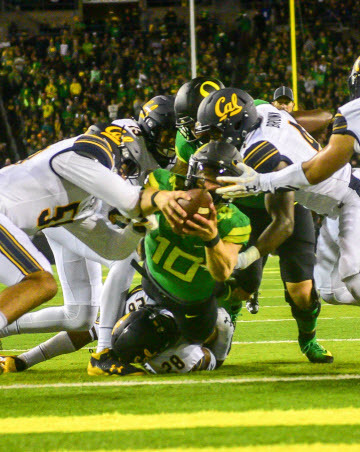 Herbert’s injury against Cal in 2017 prevented the Ducks from contending for a conference championship. Sure, not all of those quarterbacks were as highly regarded as Herbert is in the eyes of NFL scouts, but they each achieved more team success than Herbert has at this point in his career. Obviously their successes cannot be looked at in a vacuum; none of them landed in a situation as dysfunctional as Herbert did when he took over the starting job. But again, when evaluating quarterbacks, wins and losses are the most important metric, and, right or wrong, that is how Herbert’s legacy will be defined when all is said and done. That’s why this season is so important for Herbert. While he will have his sights set on winning a conference championship, he also has the opportunity to validate his greatness. All eyes are on the talented signal caller, and the table is set for the Ducks to make a serious run behind his right arm. The schedule is manageable, the team has experience, and he should be backed by a defense that will be an asset rather than a liability. Herbert should have all of the pieces in place to silence the critics in 2018. For the first time in his career, Herbert will have a championship-caliber team surrounding him. Now is his time to change the narrative and match his individual accomplishments with career-defining wins against the cream of the crop. If he is able to lead the Ducks to the heights they reached just a few years ago, he may go down as the man who saved Oregon football, not the quarterback who left us wanting more. It’s a tall task to place on someone who is now playing with his third head coach in as many years, but such are the expectations of legendary athletes. If Herbert can lead the Ducks back to the top of the PAC-12, he will have cemented his place among the Oregon greats.